Did you know that there are different types of holiday trees? Did you know that all holiday trees aren’t the same? There are a variety of options available to choose from to celebrate the holidays. 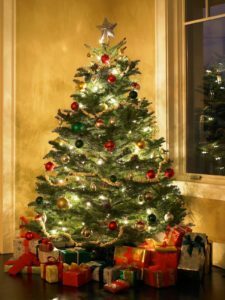 Many people choose artificial trees because they last for many years, but a lot of families enjoy the smell and atmosphere that having real trees adds to the season. Follow this guide to pick out the perfect holiday tree for your home. The balsam fir is a classic choice that is strong with dark color. This tree often provides that perfect Christmas tree shape and will fill up the space with a sensational holiday smell. Because the branches can be flexible, choose lightweight ornaments to decorate with. You can find a douglas fir tree practically anywhere. They are known for the bright color, soft feel, and sweet scent. These trees are often shorter and therefore, work better for smaller spaces. Sturdy limbs and dark green needles that stay on the tree are both characteristics that describe the fraser fir. Hang heavy ornaments on its limbs. The noble fir provides a classic look and fragrant smell. The limbs and needles are short, and lasts all season. The white/concolor fir can be expensive, but the needles are known to be soft and long-lasting. You’ll notice a smell of citrus and a blue-green color. A symmetrical shape and strong branches are the top characteristics of the blue spruce. The needles have a blue-silver color that can be a little sharp and emit an unpleasant smell if broken. The Norway spruce offers a mild scent and cone-like shape. The needles have a forest-green color and fall off easily. You can hold heavy ornaments on the white or black hills spruce. The needles have a gray-green color but emit an unpleasant smell if crushed. One of the most popular and well-known trees on this list is the scotch pine. They needles stay on the tree well and many people enjoy the long-lasting pine smell. The white pine is a soft tree, affordable, and great for people with allergies. Use light ornaments and water it frequently. This entry was posted on Friday, December 8th, 2017 at 4:32 pm. Both comments and pings are currently closed.